Playing along with the challenge at ScrapbookPal to make a card using Lawn Fawn products. Ok...I will admit to only having a couple of Lawn Fawn stamps, but I think I have all of their twine ( I love how it comes on a card where you can just "spin" off the amount of twine you want to use)....it's the little things in life! * Cut a card base and fold to measure 5.5 x 4.25 inches. Stamp sentiment about an inch or so from the bottom. * Cut a piece of whaite card stock just a bit smaller than your base card. Center fishtail die over sentiment area and die cut. * Wrap one side of diecut area with twine. Ink clouds as shown (I used a handcut cloud as my mask, then as the embellsihment to stamp my greeting). 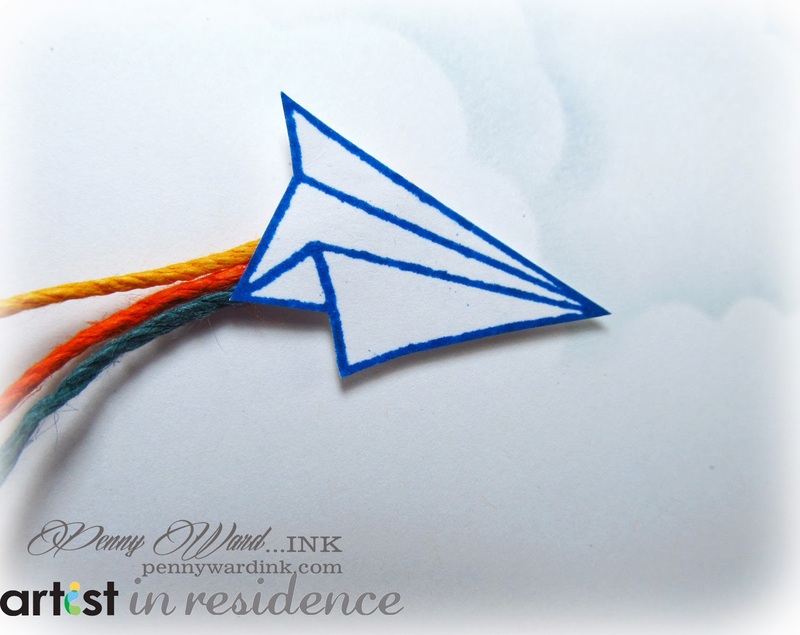 * Stamp and fussy cut paper airplane. Attach twine to back and adhere with foam adhesive. * Attach card front to base card with foam adhesive. So cute!! Love your headlines: Let's make a card: Let's go shopping: You keep your blog interesting! !